Hi there, I’m Martina and I started Equestrian Boots & Bridles early in 2016 in order to share my passion of horses with as many people as could stand me! That’s me on the left with Dante – hi! I write most of the content on the blog and I also oversee the store and all the social media accounts with help from my team. When I started the blog, I was going through a tough time in my personal life. Truthfully, I was getting out of a very toxic relationship that I was in for nearly 7 years. While I was with that guy, I had slowly dissociated from a lot of the things that made me who I am – including my love for horses. Although it’s hard for me to admit now, a while after we started dating I stopped riding, I stopped reading and learning about training, liberty work, breeding, healthcare and all of the things that had always fascinated me about horses. It had been my dream since I can remember to own a horse farm. When I was a girl I would imagine the rustic barn, the little house, the hills where all my horses would roam around grazing on the pastures. Still do actually! I wanted my ranch to be a place where horses could come for help when they were suffering from anxiety and behavioural problems. I wanted this to also be a rescue shelter for horses whose owners could not manage to keep them any longer. But somewhere along the way throughout my relationship with my ex, I had forgotten about all of that. My whole world became about trying to make my ex happy and satisfied and impressed. When I finally got out of that relationship and eventually met my current partner who is actually now my fiancé and very supportive of me, things began to come into perspective again for me. I had this massive sense of urgency to do something and felt so much regret. I realized that I couldn’t put off my dreams any further! I needed to share my passion with horses with people and I needed to work my way towards starting this ranch. 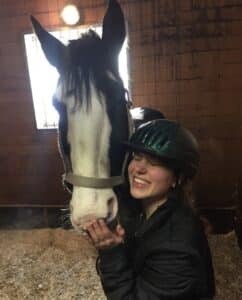 With very little money and time, I decided the first place to start could just be a blog where I try and connect with others who love horses and by so doing try and re-discover myself again. As the blog grew, I expanded the community onto social media where we now have an audience over 10 thousand people all combined! I’m so humbled by all of you and your enthusiasm towards horses and towards our brand and I’m so grateful to share this passion with you! This year at the beginning of 2018, we also finally did an official store launch after a few technical hiccups in 2017. The store is fairly new and I’m trying to make sure it’s stocked with stuff that you guys love so any feedback on what you want to see more or less of, please let me know! I’m also donating 10% of all store proceeds towards horse rehabilitation centres around North America. I’m always looking for new centers or causes to donate to so if anyone has any suggestions please let me know below! I’m also working on a line of our own english riding gear and clothing, which is taking quite a while to manufacture just right but I will keep you updated on how it’s going and when the release date is. Why Equestrian Boots & Bridles? The reason I created this site is to express my passion for horses and reconnect with it! I also always try and do my best to help horse owners and riders provide the best for their horses and themselves. So I also try and research things and look things up so that you don’t have to. I hope that I’ve made your day a little bit easier and saved you a little bit more time by some of the content in here! I know you have a million and one things you want to be doing with your time rather than staring at a computer screen like…well…riding your horse! Feel free to let me do the dirty work so you don’t have to. Please don’t hesitate to contact me with any questions or comments horse related or otherwise! Hello here. You have a great description of your dreams and passion about horses. Horses are magnificent animals. They are smart, friendly and gorgeous. Unfortunately, not everybody treats them in a good way. Horses who race and do not achieve good results, usually are left behind. I hope that you achieve your goals and help horse lovers to get information about various products and services in your website. Thanks for your kind words and support 🙂 And yes it is very sad. Horses are often treated as they are not living, breathing, intelligent and above all, loving animals. Horses have so much personality and it’s really just a shame that this isn’t appreciated like it should be. As I mentioned, horses just need to be given the chance to be horses. As i told you i also love those proud, beautiful, intelligent and faithful animals. Do you plan in your future to have a horse again? Would you go back to this free way of life? Thanks for sharing and i think you will give many helpful and interesting things for your readers. Yes living in the city isn’t fun but we all gotta make money somehow right? And yes! I am saving up to buy my own ranch one day. My dream is to run a ranch and take in abused, neglected horses and rehabilitate them so that they can be re-homed if possible. I’m also helping out a friend who wants to work with horses achieve her similar dream of running a horse ranch with her husband and their daughter. Are their a lot of Horse Ranches that work with the horses, rehabilitate them, and find them homes? Are their a lot of online Equestrian stores? What would it take, to make your dream come true, of owning a horse ranch? Are their a lot of health supplements being sold online that are not the real deal? These are some great questions that you’ve asked. There are a definitely a few horse ranches that will work with horses to work with them, rehabilitate them and find them homes. Unfortunately it’s not enough. Many owners still end up sending their horses to slaughter houses rather than deal with their issues or continue to neglect or even abandon them. There are many online equestrian stores and you can also get horse equipment through online shopping platforms like Amazon or Ebay. Some of products online are made with making money in mind rather than taking the horse into consideration. Furthermore, yes – health supplements are a problem. Not so much because they are a health hazard I would say. Most of them are harmless but they are expensive and they don’t really work. To buy ones that actually work for your horse, you need to sift through a lot of garbage – kind of like the fitness industry for us. In terms of what would make my dream come true of owning such a ranch – I would need capital to put down on the ranch, the equipment and start some type of marketing to get the word out. I would need one ranch hand to start out, a consistent revenue stream and then hopefully the operation could grow from there!